I've been vaping Hemp Bombs CBD all week and have reached my verdict. But first I want to tell you a little more about why I use CBD regularly. For me it's simple, CBD has changed my life. It helped me escape the never ending cycle of higher doses of opiates, and for that I am forever grateful. I played football from 8th grade through college and my body took a beating. I feel the pain of my years on the gridiron every single day. I'm really into pain relief and have tried all kinds of natural remedies from capsaicin to kava and everything in between. At the time of this review, I've been using CBD off and on for about three years. I kicked opiates last year and have been using CBD consistently ever since. Before I kickoff this review, I must state that these products were sent to me for the purpose of this review. I know firsthand how life changing these types of products can be, and I for damn sure wouldn't recommend a crappy CBD product to anyone. And trust me, I've tried some that will never make it onto this website. Now, let's get into the nitty gritty and see what this Hemp Bombs stuff is all about. It's always hard to describe the effects of CBD to someone who's never tried it. Depending on why you are using CBD, it can be kind of hard to tell if it's working or not. If you're usually relaxed, happy, and pain-free, idk what to tell you. Those are the things I look for to know if a particular type of CBD is working or not. I can always tell when my CBD starts kicking in by how relaxed, happy, and pain-free I feel. The way I measure the effectiveness of CBD is far from scientific, but it works for me. You'll have to find what works for you by testing a good product or two. Well let's start with the obvious, the branding is impressive. While I would never buy a product solely because of the branding, it's a good sign. Companies that can afford to brand themselves also can afford to source quality hemp. But I have been duped before by a really well-branded company so I'm no longer a sucker for a good brand, but it's still comforting. If a company looks like it was scrapped together in someone's basement, I'm immediately more leery of the products. I'd buy a computer that was put together in a basement, but I wouldn't touch a vape juice or any health-related product that wasn't made in a clean environment. Basically, what this really comes down to is lab testing. After taking one look at their products, I assumed they were lab tested. I was right in this case, but have been wrong in the past. Hemp Bombs has all of their third-party lab tests published on their website. If a product doesn't look lab tested, always double check with the company's website before trying it. Lab testing is a must in this industry, but we'll dive into that more later. Overall, I was impressed by the packaging and branding of the Hemp Bombs CBD vape juice. It was a gloomy day and was raining off and on. Gloomy days are the worst for my back. My back was throbbing and I had been squirming all day trying to pop it to see if I could achieve five seconds of pain relief. That's when I decided to tear into the Exotic Watermelon Kush. I put it into my Gnome tank and started vaping it on the RX GEN3 at 65W. The first sign of the vape juice starting to kick in was that I became calmer. I was kind of cranky because of the weather and my back pain. My wife knows that I have serious beef with gloomy days and she was so happy to see me perk up. After I started feeling more normal instead of cranky, I knew Hemp Bombs CBD was in fact legitimate CBD. Some companies only have trace amounts of CBD in their products and use other things like melatonin to get you to feel some sort of effect. After getting relief for my mood, I knew it was just a matter of time before I started feeling the football pains melting away. I kept taking rips from my vape and played with the wattage. The Watermelon Kush was really enjoyable between 50W and 55W. I just kept vaping away and before I knew it, my back pain started to lessen. Eventually, I forgot about my back and just felt good. I didn't get an overwhelming, rushing sense of relief like I used to get with opiates. With CBD, it usually comes on slowly and subtly. The pain and anxiety usually just dissipates until I forget about it. At that point, I just feel good and am able to focus on my work or enjoy time with loved ones. Without any kind of pain reliever, I'm usually annoyed, short with people, squirming in discomfort, and not fully present. I'm going do describe each flavor that I tried as best as I can. 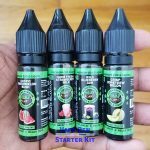 Describing CBD vape juice flavors is no easy task, so just hang in there and try to pickup on my vibe. I also tested each flavor on my wife without telling her the flavor beforehand, which was hilarious. I should have recorded it but YouTube suspended my CBD channel without telling me why, so I haven't been recording much. Not sure what I did wrong on the channel, but I'll probably start another one sooner than later. This was the first Hemp Bombs flavor I tried. I had high hopes for this flavor but didn't know what to expect. I didn't know if it was going to taste like watermelon and hemp or was it just going to taste like watermelon? A lot of times fruit flavors can be overly sweet and nauseating, so I really didn't know what to expect. So…after taking a few rips I started to get a feel for the flavor. It tastes like a hint of watermelon candy, but I didn't taste any kush-like flavors. The sweetness lingers on your tongue for a split second, but it's elusive. It's hard to put your finger on it exactly. The closest thing I could come up with for a comparison is a watermelon gummy candy. It's not a perfect comparison because this vape juice doesn't have the sweetness of a candy flavored e-liquid. But that's just what it reminds me of. It's like being blindfolded and teased with some kind of watermelon flavor but not ever figuring out what it is. The flavor is subtle, which is nice. I much prefer subtle to overly sweet. If a CBD e-liquid is too sweet, I will literally get nauseas. The sweetness is so light that this flavor can definitely be an all day vape. Basically, watermelon is a tough flavor to nail. If I were doing a blind taste test, I don't know if I'd be able to guess that it's watermelon. Regardless of whether it taste exactly like watermelon or not, I still enjoyed the flavor. It's hard to get sick of something you can't quite put your finger on, so I just kept vaping it all day. I've tried several flavors and Exotic Watermelon Kush is my favorite so far. I will update this if that changes. This is also my wife's favorite, and she tried it without knowing what flavor it was and without knowing that it was my favorite. Unlike the Watermelon Kush, the Wild Blueberry Jam tastes exactly like blueberry jam in my opinion. The flavor is not as subtle as the Watermelon Kush, but it still airs on the subtler side. It's strong for a subtle flavor, if that makes any sense. On the nasal exhale, I can taste a nice and even jam flavor. On some e-liquids, the beginning of the exhale has different notes than the end. I find this to be the case a lot with blends that have citrus in them. With this Bluberry Jam, it's pretty even througout the exhale. On the inhale, the blueberry flavor is prominent while the exhale has a sweet jam flavor. My wife and I both enjoyed this flavor, but Watermelon Kush remains my favorite. This flavor had a very interesting profile to me. It kind of reminded me of Laffy Taffy® in a subtle way. You know how the banana Laffy Taffy® isn't overwhelmingly bold? It reminded me of that, but with a subtle honeydew flavor instead of a banana flavor. 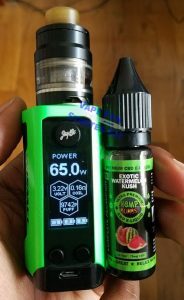 I enjoy fruity flavors, so naturally I liked the subtle honeydew profile. But what really intrigued me about this flavor was how different it tasted at different wattages. When vaping at around 55W in my Gnome tank, that's when it reminded me of a honeydew Laffy Taffy®. I liked this one so much, I decided to put it in my V2 Pro Series 3 which is not as powerful as the Reuleaux Gen 3 kit. The Series 3 is one of my on-the-go vape pens. And honestly, it tasted like a totally different vape juice. I don't really have words to describe the flavor profile in the Series 3. It's still delicious, just very different. In hindsight, I probably shouldn't have put it in there. I don't think the standard Series 3 e-liquid cartridge is designed for high VG e-liquids lol. Whoops! Either way you slice it, I did enjoy the Crisp Honeydew Melon vape juice and would recommend it to any fruit lovers. I'm more of a fruit flavor guy. I don't really like deserts and things. So no, I'm not a big fan of the Strawberry Milk flavor. I did vape a whole 4mL tank of it, but it's just not my cup of tea. I wouldn't describe this flavor as subtle like the other flavors. It was more along the lines of bold, but not overly bold. The flavor wasn't too strong or too sweet, but it was pronounced. She literally guessed, “strawberry milk?” That's how much like strawberry milk this flavor tastes like. The accuracy of the flavor is shocking. If you made it this far into my review, you deserve to get a discount. Use the coupon code KIT10 to get 10% off your total purchase. If you're feeling adventerous, throw in a pack of CBD gummies. They're effing delicious and provided me with long lasting relief. Like twice as long as one vape sesh lasts. You won't regret it. I tried several of Hemp Bombs CBD vape juices and their CBD gummies. I might review the gummies in another article but maybe not. I'm not sure if vapers are interested in CBD gummies are not. In short, the gummies were effective and tasty but I need more time to test them thoroughly enough to compare them to the gummies I currently take. But I did test the CBD e-liquids thoroughly. I vaped them for a whole week, through gloomy and sunny weather, fresh coils, and in different devices. Overall, I was really pleased with the vape juices but will be getting the stronger version for my rotation. I had to vape a lot before the 75mg version kicked in with the relief. That's really my only gripe. The fruit flavors were delicious and vaped clean. They didn't gunk up my coils like some other brands have. The Exotic Watermelon Kush and the Crisp Honeydew Melon are the two flavors that made it into my regular CBD vape juice rotation. I really liked those flavors. Side note: I really appreciated the lab certificate they put in the package. Companies that openly share their test results make me feel so much more comfortable. To sum it up, I was pleasantly surprised and happy with the quality of the products from Hemp Bombs and have already recommended them to my family. Most importantly, the products are effective and lab-tested. If you're interested in trying their products, visit HempBombs.com and don't forget to use the friggin' coupon code KIT10!